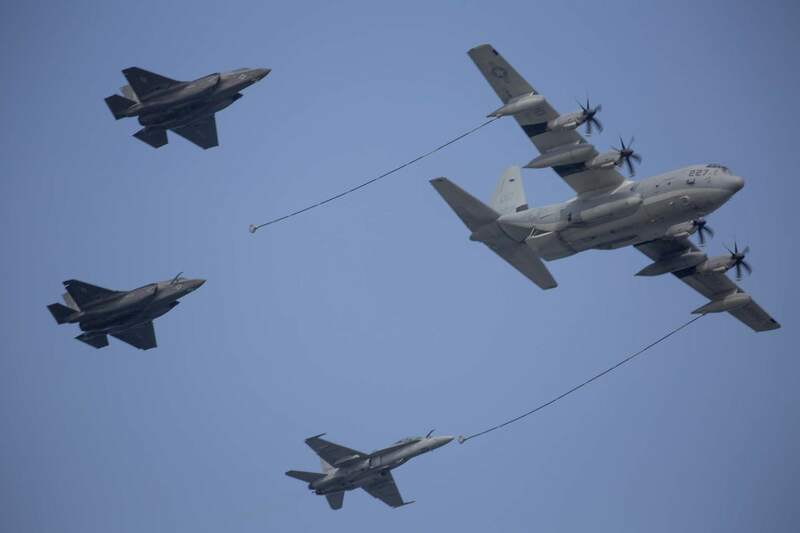 Two U.S. Marine aircraft crashed early Thursday during a refueling drill, leaving five crew members missing after two were rescued off the coast of Kochi Prefecture later in the day. 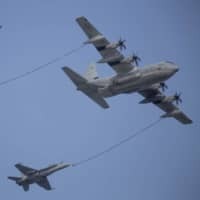 A KC-130 air-refueling tanker and an F/A-18 fighter jet were involved in what the military termed a “mishap” in the early morning hours. One crew member was rescued later in the morning by the Maritime Self Defense Force and sent to a hospital, while another was rescued later in the day, according to the Japanese Defense Ministry. The Marine Corps said the second marine had been transported to a local hospital. One of the two was a crew member of the F/A-18. The F/A-18 had two crew members while five were aboard the KC-130. “Search and rescue operations continue for U.S. Marine Corps aircraft that were involved in a mishap … off of the coast of Japan around 2:00 a.m.,” the Marine Corps said in a statement. The statement said the aircraft involved had taken off from U.S. Marine Corps Air Station Iwakuni in Yamaguchi Prefecture, and had been “conducting regularly scheduled training.” The Iwakuni base is home to the sole forward-deployed marine squadron of F-35 stealth fighter jets. The Marine Corps said the cause of the accident was under investigation, but the difficult refueling maneuver would have been complicated by a lack of sunlight and any difficult weather conditions at the time. During the refueling, the smaller fighter approaches from the rear of the KC-130, which has a fuel line trailing behind. An extendable nozzle is then “plugged in” to allow fuel to flow. After learning of the crash, Japanese search and rescue aircraft “immediately responded to aid in recovery,” the Marine Corps said. The U.S. military’s III Marine Expeditionary Force, headquartered in Okinawa Prefecture, expressed gratitude to the MSDF for the help. “Extremely thankful and grateful for our Japanese Self Defense Force partners and their help in the search and recovery efforts,” the III Marine Expeditionary Force’s public affairs section wrote on its official Twitter account. Accidents involving U.S. military aircraft have become a sensitive topic in Japan in recent years after a spate of crashes — especially in Okinawa Prefecture, which is home to the bulk of U.S. military facilities in the country. Defense Minister Takeshi Iwaya told a televised news conference that while Japan is concerned, it was now focusing on helping find the missing marines. In June, a U.S. Air Force F-15 fighter jet crashed in waters off Okinawa Prefecture during a routine training mission. The pilot successfully ejected and was safely recovered by an Air Self-Defense Force search and rescue team. In November last year, a U.S. C-2 cargo plane carrying 11 passengers and supplies from the base at Iwakuni to the aircraft carrier USS Ronald Reagan crashed during an annual bilateral maritime field-training exercise with the MSDF. Eight people were rescued and three died in the accident.